Is there a website with current river water levels for Arizona/Utah? Is there a website that water meters on rivers report to? I am planning a white water river trip and I am worried the river will be dry. I know there are meters on the river but accessing them or finding a website with the current levels is a nightmare for one river to the next. I live in Arizona so ideally the site would at least have my rivers but I often head to Utah for the Colorado, the San Juan, and the Green rivers. 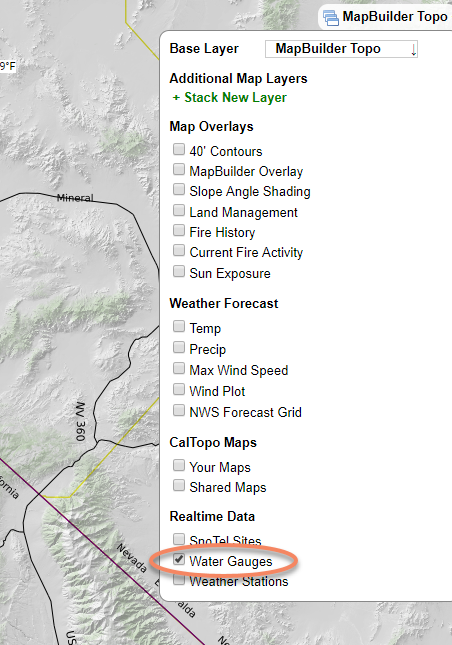 My recommendation would be to use caltopo.com, which is a quick way to check water levels. RiverApp (riverapp.net) has a pretty good selection of paddlable rivers across both Europe and the States. The data is all just coming from the separate national services, but it's nice to have them in one place. Popular runs sometimes even have useful notes on recent hazards attached from other users. It's quite a handy tool to use at home or on the move. Not the answer you're looking for? Browse other questions tagged united-states weather rivers whitewater-rafting or ask your own question. Can I sail a raft on a European river with commercial traffic? What is the best stroke for swimming in rapids aggressively? Why do some people stand inside the river fishing? How can I use horsetail as a “indicator plant” to find gold while gold pannig?